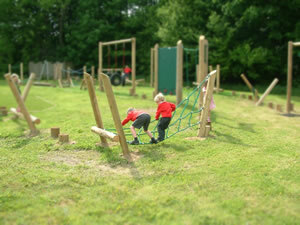 Malc Firth Landscapes Ltd offers a wide range of play equipment for all ages and abilities, in both steel and wood. All equipment is kite marked to the British standards. We provide various options of safety surface depending on the equipment being used and the budget available. Rubber wetpour is one of the softest surfaces available to the market, black wetpour is installed from 100% recycled rubber. Wetpour can be laid in different depths to suit different play apparatus fall heights. With 12 colours to choose from wetpour can be laid incorporating any number of design features. Wetpour requires a prepared base prior to installation this means it can be laid directly onto tarmac or concrete. Grass areas need to be excavated with 5 inches of compact stone and edges laid prior to installation. Our woodchip surfacing is an all weather safety surface that maintains a natural feel and allows fall heights of up to 3m. It is a cost effective alternative that requires no maintenance. Saferturf surfacing in its simplest form is an ideal product to replace worn-out and muddy grass areas or to soften tarmac and flagged areas. Saferturf installations can be upgraded with a design pack to include numbers, letters, shapes, footprints etc to add interest to the surface that can also aid numeracy, literacy and co-ordination skills. Safermats are the cost effective solution for achieving critical fall heights of up to 2m on grass. When installed onto good quality, well-compacted grass they will provide an extra-wear coarse enabling extended use of grass area. The grass needs to be maintained as usual.